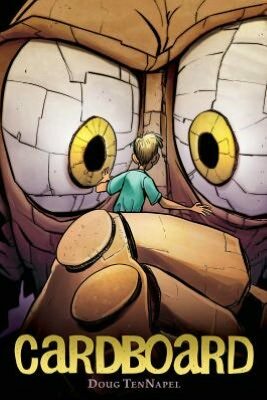 “Cardboard” by Doug TenNapel is one of the most original ideas ever. It’s about a boy named Cam and his father. Cam’s mother died when he was little. On Cam’s birthday, he is given a cardboard box. That’s all his dad could afford since he had just lost his job. They made a boxer out of the cardboard. Late at night it comes alive. They name him Bill. A neighbor named Marcus who is jealous of Cam squirts Bill in the legs, which makes them melt. Cam and his dad make a magical cardboard maker out of the scraps to make new legs. Cam starts making tons of little cardboard creatures. Later, Marcus steals the maker. He makes an army of cardboard monsters that rebel and take over the neighborhood. That’s really all you need to know. The artwork is the same as all Doug TenNapel’s other books. It has a straight line-y look to it. It also has lots of shading and color that give the impression of each strange environment. Each character has a distinguishing look. Some characters have big heads, long necks or bulky noses. Doug TenNapel has also written other awesome books like Ghostopelis, Bad Island and Gear. His work is in every library I’ve ever visited. P.S. : Doug TenNapel is also the creator of Earthworm Jim, a very famous video game. P.P.S. I JUST LEARNED THAT CARDBOARD IS BEING TURNED INTO A MOVIE WITH TOBEY MAGUIRE!!!!!!!!!!!!!!!!!!!!!! how do i set up for notifications by email for new posts of yours? i love this blog and your moms zine!!! Thanks for the review. I'm glad to hear it's an original idea, because originality is one of the things I enjoy most in a story. I like plenty of familiar things too, but if there's not something totally original about a work, I will become bored by it quickly. It sounds like a sad story, what with the dad being broke and the mom being dead, but it also sounds like the boy and his dad learn how to literally make their own fun. As a father, I always hope I can teach my son that he doesn't need a lot of money to enjoy life. Of course, I hope he always has enough money to have his needs met, but I also believe that even some cardboard can be more fun than a box of legos if we use our imagination. Still, my kid's getting Legos for Christmas because he'd be really upset if I just gave him a piece of cardboard and said, "Use your imagination." But I think that if I were broke, my son would understand that cardboard was as good as it was going to get that year. Kids kinda know when you're at your limit, vs. just putting them through a tough time to teach a lesson of some sort. Anyway, thanks for the thought-provoking review! Keep 'em coming! Arthur here. Sounds like a really cool story. Kind of scary, but kind of cool. I liked your review of it a lot. You painted the picture really well. Thanks a lot Milo. This is another good one for my son Isaac. Guess what his dad does for a living? He makes boxes! That's right, he's the president of a corrugated box factory. So this will be the perfect book for us, a family that lives, literally, on boxes. Milo - This sounds like an awesome book. I also loved your description of the book first as "one of the most original ideas ever" and then as "funny, eerie and unique." Very clear. Also, I was a little obsessed with making things out of cardboard as a kid, so I think this story will really speak to me. One thing I built was a spaceship cockpit out of packing box that I could climb inside and pretend I was an astronaut. One time, Uncle Sam convinced me it would be fun to pretend I was being attacked by aliens and then proceeded to kick a soccer ball at the cockpit - with me in it! - until the whole thing kind of fell apart. Uncle Sam really enjoyed that game. the next post is about PIRATS!!!!!!!! It was very adventurous. I hope it does get made into a movie. Great review Milo - we loved this book too! That sounds like a great book! I'm going to keep my eyes peeled for this one. Thanks! There is over 40 years history for China's packaging and printing industry .